Bonna Wescoat, Samuel Candler Dobbs Professor of Art History, has sent students combing the campus on scavenger hunts, helped them conduct an optical experiment about the Parthenon frieze, and directed excavations and created 3D renderings in a bid to unravel the mystery of a religious sanctuary important to Greek and Roman antiquity. For her success, Wescoat has been honored as the 2017 recipient of the Archaeological Institute of America’s Excellence in Undergraduate Teaching Award. She recently received the award at the organization’s annual conference in Toronto. The national award recognizes individuals who, among other things, have developed innovative teaching methods or interdisciplinary curricula and are actively teaching. Wescoat has long put herself into the environments in question. Since 1977, she has traveled to the Greek island of Samothrace for excavations meant to uncover the history and legacy of the Sanctuary of the Great Gods. She was named to the directorship of excavations in 2012, overseeing work at one of the most significant sanctuaries in Greece. Her Emory team on the project is highly interdisciplinary, with students and scholars working in architecture, sculpture, epigraphy, ceramics, statistics, geology, geography, environmental sciences, conservation and more. That work informs her seminars based specifically on the research, as well as her first-year seminar “Myth and Legend in Ancient Greek Art,” and 200- and 300-level classes on art and architecture in ancient Greece and Rome, says Carla Freeman, senior associate dean of faculty for Emory College of Arts and Sciences. 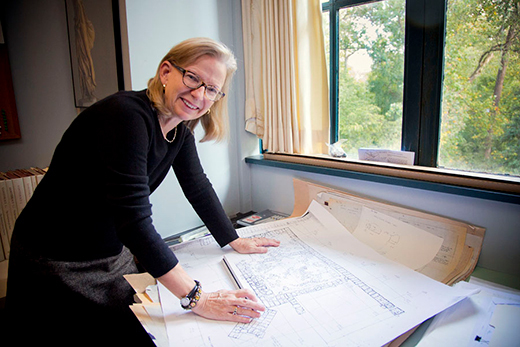 “In all her courses, she endeavors to introduce students to the evidentiary and interpretative value of primary evidence, demonstrating how such evidence is found, marshaled and interpreted,” Freeman wrote in a letter nominating Wescoat for the AIA award. In all of Wescoat's courses, including those in the architectural studies minor that she played a critical role in devising, she makes the ancient come alive with hands-on engagement. For instance, she and her students tackled the question of a seemingly overlooked part of the Parthenon in Athens by installing test panels in a replica in Nashville. At issue was why the iconic frieze, depicting a ceremonial procession, was placed high on the outside wall of the Parthenon’s central chamber and partially obscured by the surrounding colonnade. Some scholars suggested the detail of the work would have been lost in the shadows, even guessing the frieze was added as an afterthought to the original building. A video documents the extensive work students put into the optical experiment testing the visibility based on the precise Nashville replica. The conclusion: The view is optimal to tell a narrative to guests as they walk up to the structure. To that end, even the scavenger hunts – which send students off to find the likes of Aphrodite and casts of the Mausoleum at Halicarnassus on campus – help train students to integrate the beauty and purpose of art.